The distillery meanwhile went from strength to strength and now in the ownership of Diageo, is one of the largest distilleries in Europe. Haig Gold Label is still available if you look in the right places. It’s an easy drinking single grain and 40% malt blended whisky with no pretensions other than to provide a simple dram of something nice. For many years, Haig Gold was one of the best selling Scotch whiskies in the world until the 1970’s when its popularity declined. Nose: Smooth and light with hints of fresh grass and lemon. Taste: Very mild and smooth with a faint hint of spice or pepper from the malt as it takes hold in your mouth. Finish: Spice fading to faint smokiness. Haig Gold Label is all things to all people. Safe reliable and consistent. The beauty of Haig Gold Label lies in the production values of the largest distillery in Europe and the mastery of the blending. This is a classic and versatile One Pooka whiskey which could easily make a come back as the next step up for newly converted Haig Club drinkers looking for a whiskey with slightly more pedigree and substance. This is an old bottling dating from the 1950’s of the classsic Haig Gold blended Scotch whisky complete with spring cap. It’s from the well respected whisky merchant The Whisky Exchange, so quality and provenance of this very collectable Haig Whisky is assured. Haig Gold was the classic blended Haig Whisky until the House of Haig labels fell out of popularity in the last 30 or 40 years. Haig Whisky was once one of the most famous and popular Scotch Whisky blends in the world. This bottle of Haig Gold dating from the 1950’s is complete with spring cap and is supplied by the well respected whisky supplier The Whisky Exchange. Bushmills Original is an ideal first whiskey for the Irish Whiskey novice. What better way to buy someone their first bottle of Irish Whiskey than in a beautiful dark luxury wooden presentation box. This is how I receeived my own first bottle of Bushmills. I still have the wooden box 30 years later! A 1960’s bottling of the Classic Haig Gold blended Scotch whisky complete with spring cap. Up to 40 years ago, Haig Gold blended Scotch Whisky was one of the most popular Scotch whiskies in the world. Haig Whisky is one of the oldest whiskies in the world and was distilled continuously for over 300 years at the Cameronbridge distillery in Scotland. Haig Gold was one of it’s most popular products and this is your chance to secure a little piece of Scotch whisky history. This bottle of Haig Gold dates from the 1960s and is complete with spring cap. This large and rare 2 litre bottle of old Haig Gold blended Scotch whisky dates from the 1970’s and is a unique opportunity to collect a very large bottle of Haig Whisky history. Haig Gold blended Scotch Whisky was one of the most popular Scotch whiskies in the world until it fell out of popularity some 30 or 40 years ago. This bottle of Haig Gold blended Scotch whisky carries the seal of King George VI who was father to the present Queen of England. This dates the bottle to before the old kings death in February 1952. 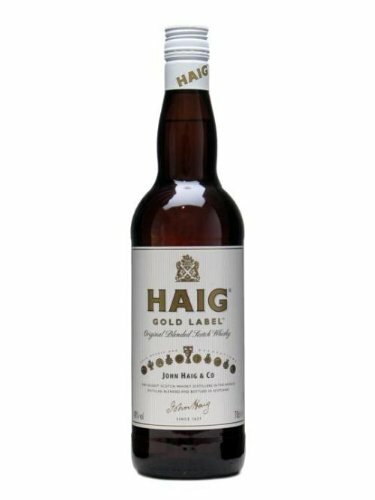 A wonderful opportunity to buy a rare surviving bottle of classic Haig Gold blended Scotch whisky dating from the pre-war 1930’s. Haig Whisky was one of the most popular scotch whiskies in the world at the time this bottle was distilled. Haig Gold was a classic and easy drinking blended Scotch whisky. So bring back memories of Fred and Ginger or Jeeves and Wooster! An unusual Cork Stopper bottle of the classic and popular Haig Gold blended whisky dating from the 1940’s. This is probably the whisky that Spitfire pilots were drinking in their down time! It was also the whisky that their GI American comrades discovered while training in the UK during WW2. They brought their new found taste for Scotch whisky home with them and the US Scotch market of the 50’s and 60’s was born. A rare and unusual Imperial Quart bottle of Haig Gold blended Scotch whisky which was once Scotland’s most famous and most popular Scotch whisky Drams. SOLD OUT OF CURRENT STOCK! The 1960’s were the hey day of popular Scotch whiskies such as Haig Gold. This is the type of Scotch whisky that the Guys in Madmen would have been drinking. So, if you fancy a taste of the swinging 60’s this is the bottle of Haig Whisky to buy. Haig Gold blended Scotch whisky was one of the most popular and common Scotch whiskies in the world up until 30 or 40 years ago when the brand fell out of favour. It is still available if you look hard enough so, look no further than here! All of the “buy online” links on HaigWhisky.com give you a chance to buy Haig Gold Scotch Whisky online from Amazon, Whiskey Exchange or the Master of Malt for which we are affiliates. Each of these reputable vendors will then process your order securely and deliver your Haig Gold Scotch Whisky directly to you to enjoy. Stuart says – “you will enjoy”. Haig Whisky is the oldest of all scotch whiskies and may even be the oldest whisky in the world. Haig whisky is steeped in history since it was first distilled by John Haig in Cameronbridge Scotland in 1824. From these humble beginnings, Haig Whisky quickly rose to become one of the most successful and popular Scotch whiskies in the world and now offer four Scotch Whiskys: Haig Club Single Grain Scotch Whisky, Haig Gold Blended Scotch Whisky, Haig Dimple Whisky & Haig Pinch Whisky.